Located in Rincon Puerto Rico, this beach front 4 unit beach house is a perfect home away from home for extended stays. It is situated along fabulous Sandy Beach, one of the most scenic beaches in Rincon. It is also located close to the famous 'El Faro' Lighthouse and some of the best restaurants in Northwestern Puerto Rico offering Continental and Native Criolle foods in their menus. This serves as a good central location from which to visit the rest of the western half of this Caribbean island. Each two bedroom apartment is equipped with ceiling fans, cable TV, some with A/C, full kitchen, and fully furnished. Prices: 4 guests: daily rates of $150/per day, $1200/wk + 9% lodging tax. Relax in the spacious surroundings offered by the gated areas next to the beach. Go past the gate to the beach to enjoy the water and the surf. 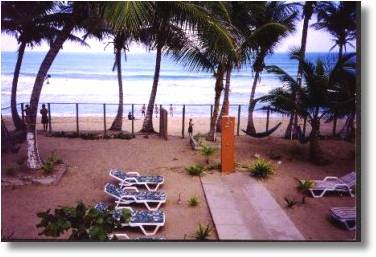 This apartment home is located on Sandy Beach; one of the best surfing beaches in Rincon during the winter, and a perfect swimming beach during the summer. Pelican Point is also located next to the Tambu Tavern, a popular local ocean bar, and eatery. It is also offers convenient access to shopping areas, and other tourist sites in the Northwest. Gambling casinos are just a short drive away in Mayagüez.